Here is the old VW Bus Camper Van painting that I finished today. I focused on the camper itself, trying to make it look old. I used a smoother paper than I usually use. The smooth paper shows more brush strokes and lends itself to an old, mottled finish. I kept the background simple and used spatter in the foreground. As I was painting I tried to get the paint on with as few brushstrokes as possible. I added the fishing rod detail last. This will fit in a ready-made frame that has an inner mat. Let me know if you have any questions or comments below. 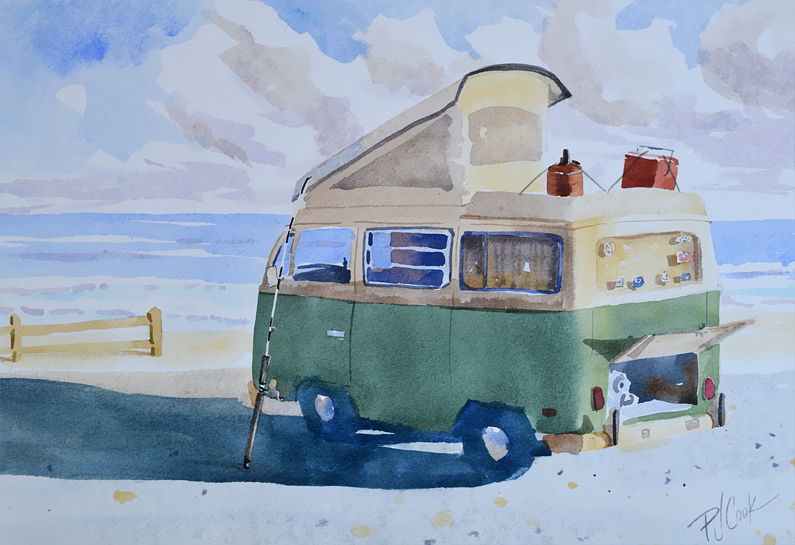 I liked very much to see your old van drawing in your previous post, and now, I see how you solved your beach watercolor. It is fabulous. I have one question. Could you tell me why you sign your work front and back?. And when you say back, do you mean on the back of the paper or on the back of the frame? Thanks Mercedes, I’m glad you liked the old vw camper van drawing and painting. I always sign a painting in paint on the front and on the back of the watercolor paper I sign in pencil. If it is an oil painting I sign back of canvas or panel in a black marker. Sometimes I also write name of painting. What paper did you use? This turned out really nice! Hi Laura, I used Lanaquarelle paper I think, it was a different paper than what I usually use. I sold it so I can’t go and see what the paper was. I usually use Arches paper. Thank you!